Hi, I'm Katie from Sew Woodsy, and I can not tell you how excited I am to be on the Brooklyn Limestone today! Brooklyn Limestone has been one of my Halloween go-to blogs for inspiration over the past few years. First, let me tell you a little about us; we are a husband and wife craft team. We work together on Home/DIY projects. Mr. Woodsy loves wood working, and well, I like to sew! 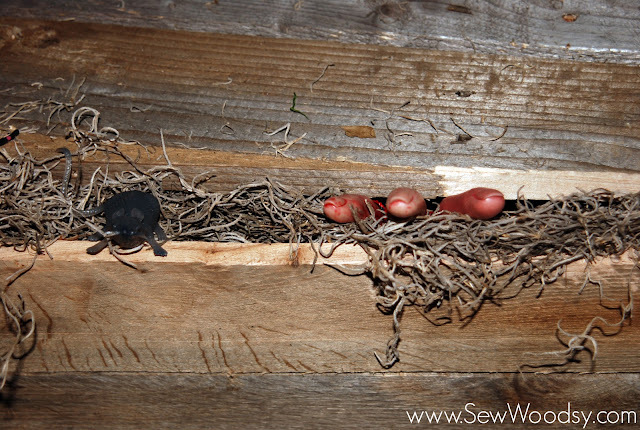 Hence our name "Sew Woodsy". Halloween is our favorite holiday to decorate. We take everything off our walls and transform our home into a Halloween Haven of sorts (plus we host a pretty cool costume party)! I always loved Halloween as a kid. The fact that you got to dress up as something else for a day and had a chance to decorate always intrigued me. I will say that I always wanted my house to be the "scary" house on the block. Where all the children would flock too, and talk about months after. Once I became a home owner I knew I wanted our home to be "that house". Luckily, Mr. Woodsy agreed! We've only been decorating our home and the outside for 3 years now, but one would think otherwise after looking at our extensive Halloween decor and prop collection. Lucky me, Mr. Woodsy is handy and when I bring an idea to the table he can deliver above and beyond. Let's take a look at some of my favorite projects that we document last year. After Mr. Woodsy became self-absorbed in wood working I really started thinking out of the box (as far as props went). On a whim one crispy Fall day (well maybe not so crisp--we live in Florida) I asked him if he would make a rustic coffin. I knew we didn't want to spend any more money on Halloween decor which would require free wood. A giant light bulb turned on; pallets! They are rustic and free! Thus, after a quick drawing... the rustic wood coffin was born. I still can't get over how awesome this coffin is. A bit larger than I ever dreamed of and I suggest if you ever make one to not put it in your attic for two reasons. 2. Try getting down a 50lb + wood coffin from the attic. I added moss and a few bloody fingers peaking out of the coffin to add an additional touch to it. Isn't it creepy? We also draw quite a bit of Halloween Inspiration from Grandin Road. One day we might buy tons of decorations from there, but until then we will recreate our own versions for a fraction of the cost! 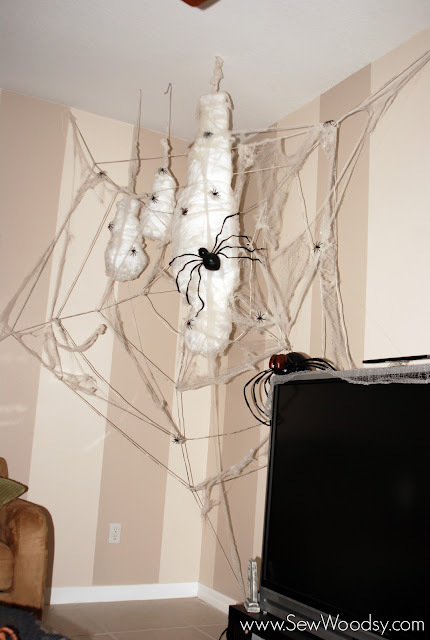 Our first year in our house we created this giant spider web and webbed person. Last year we created the larva sacks to go on the web. As you can tell this spider web actually takes up a large portion of our living room.Three years ago I found a bloody hand print shower curtain for $20+. I didn't want to spend that much money on a shower curtain that would only be displayed for a month. That's when I decided I could make my own. 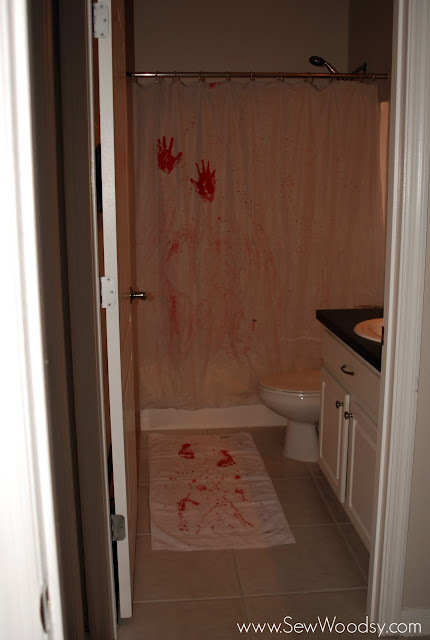 For $20 I created a creepy cool bathroom that is always the talk of the party. This year I'm excited to announce that we are changing our bathroom up a bit. 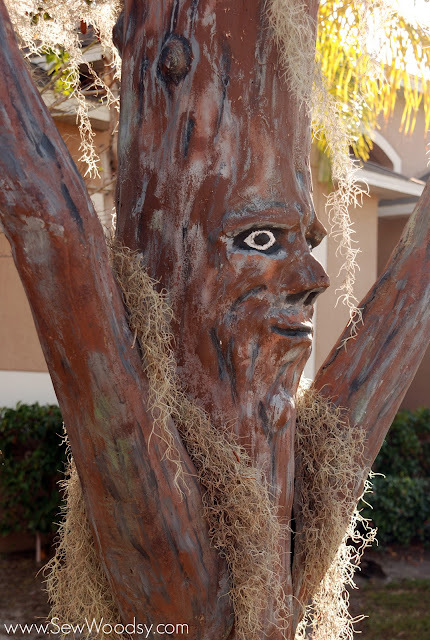 Last but not least; last year Mr. Woodsy surprised me with some super cool spooky tree's. Right off the set of The Wizard of Oz. They didn't look this great at first. They were retired a while back (like 10-15 years a while) and needed some major love. Mr. Woodsy rehabbed them and added some moss from the woods behind our house. Needless to say these bad boys were the star of our party and of all the trick-or-treaters. I can't tell you how many times I would open the door and see countless parents shuffling their children in-front of the trees making them pose with the tree's while they took their Halloween picture! 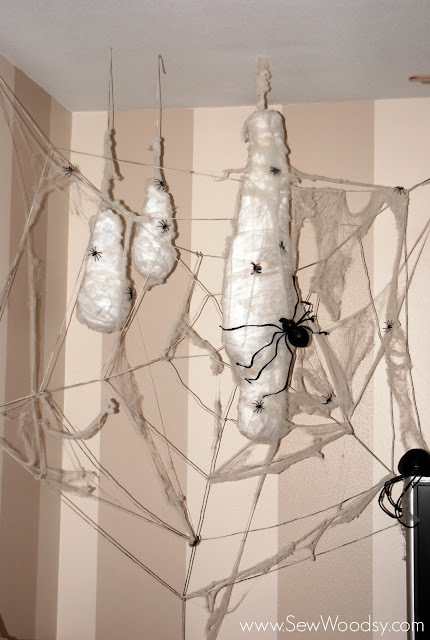 I hope I was able to inspire you to create Halloween decor for less. It is definitely possible with a little "elbow" grease and creativity! I hope you'll stop by Sew Woodsy and check out all of our Halloween projects. Don't forget to follow us on Facebook and Twitter. I love to give "sneak peaks" into what we are working on! Of course, most importantly, I hope you have a wonderful Halloween! lol! I'd love to know if there's a story behind the bit with the cable guy. Really creative and inspirational. Love a good budget based idea. lol... let's just say that the cable guy seemed spooked out and asked us why we had a coffin in our attic. We reassured him it was for halloween and we used it as a prop in our main entrance way. He was like "I've seen a lot of odd stuff in people's attic's but I've never seen a coffin..." needless to say I think we kind of freaked him out. We look like an ordinary couple in the suburbs so I think it was the last thing he was ever expecting to see in our attic. I love the ideas. And the poor cable guy story. Too funny. I really enjoy trying to recreate the expensive items too. All but one of my full size stand up props are made by myself. Great job decorating. 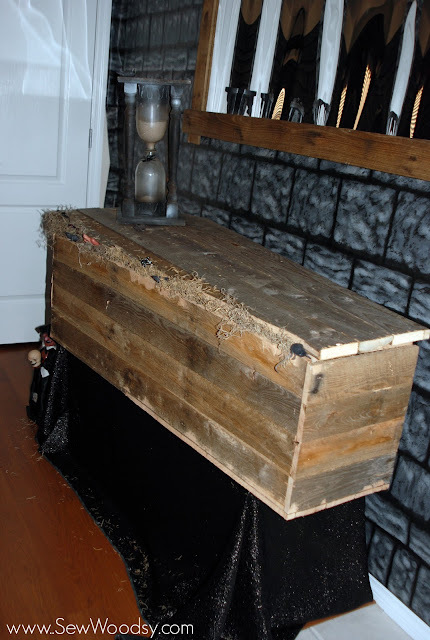 I love the coffin - I need to find some pallets now! I was planning on making a coffin out of foam insulation for my son's haunted house party but this is much more theme fitting! Wow, you are totally the "Halloween Queen". I wanted the title, but I really must relinquish it to you! That bathroom is awesome! holy cr@p! your decor is so great!! LOVE the coffin and I totally almost spit out my soda when I read the part about scaring the cable installer!